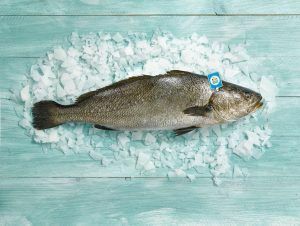 Corvina REX, just as Frescamar’s sea bream and sea bass holds the seal “Crianza de Nuestros Mares”, a guarantee of its national origin and its maximum freshness and quality. And since “the closest, the freshest”, in the case of Corvina REX the breeding is carried out in marine farms on the Mediterranean coast, in the waters of the Valencian Community (Burriana, Calpe-Altea and Villajoyosa). Additionally, the feeding of the fish is made with natural feed, free from genetically modified organisms and production is accomplished with total respect for the environment and the animals’ welfare. “Crianza de Nuestros Mares” represents a true milestone in the history of Spanish aquaculture. Its main objective is to contribute to the encouragement of a sustainable and competitive production that benefits the entire value chain. A seal placed on the gill in the form of a tag allows to identify the certified fish showing the brand logo. In order to increase consumer awareness, the initiative has linked the campaign to a great communication plan that includes, among others, press advertisement in national distribution magazines such as “Hola” and Sunday supplements of the country’s most popular newspapers, and internal moments and spots in leading programs of the most popular TV channels such as Antena 3 or Tele 5. Spain is a leader in aquaculture production within the European Union (holding the third place behind UK and Greece) with around 300,000 annual tons and a wide variety of species of commercial interest. Thanks to aquaculture, the growing demand for quality fish products can be responsibly supplied.